The autumn leaves around Georgia are a wondrous sight to behold; however, these colorful leaves can spell trouble for your landscape if left to their own devices. Leaves left covering grass and other plants can block much needed sunlight during this time of year. Also, with all of the rain we’ve had lately, these leaves can create a thick mat that smothers plants and invites in lawn disease and other issues. Hutcheson Horticultural Company wants to make sure you know the importance of continuous leaf removal from your green space throughout fall, so we’ve put together some tips to help out. Tools – Buy the proper lawn tools that you want to use in your yard. This could be simply a rake (we recommend those with extra-wide thin prongs), an electric (more environmentally friendly) or gas leaf blower (a rake may still be needed if you have wet leaves to deal with) or a lawn mower is also another useful lawn tool to handle leaves. Consistency – If you live on property that has a lot of trees with leaves that are consistently falling, then you will need to be a little more proactive with removal than someone who only has one small tree to deal with. 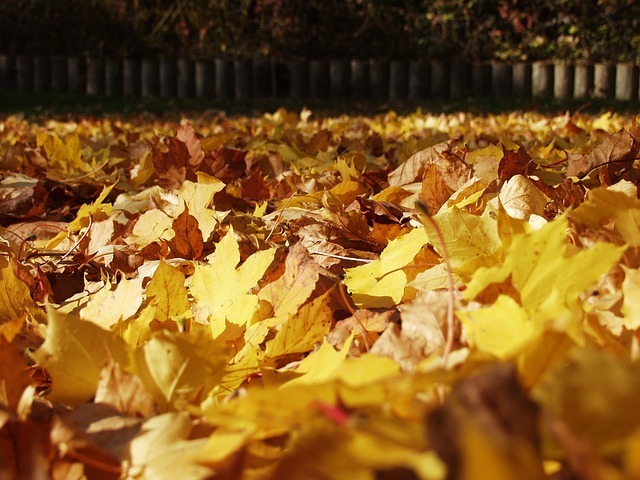 Those with small amounts of leaf ‘litter’ may only need to remove leaves twice during the fall (unless rain/decomposition begins to mat the leaves); whereas yards completely covered by leaves every week will need to be cleared every week, to avoid damage to the landscape. Moving/Disposing of Leaves – Transfer ‘mowed’ leaves from your lawn mower bag into eco-friendly bags or use your leaf blower / rake to move the leaves onto a tarp, and then bag for removal. If you have a compost pile, adding the leaves into the mix is a great way to reuse them. If you’re already into composting, making ‘compost tea’ for your landscape may be something you’ll be interested in; learn more about it here. If you have any questions about leaf removal, or would prefer to let our team take care of your landscape maintenance this autumn, please contact us at Hutcheson Horticultural Company by calling 770-924-1001. We look forward to hearing from you!